Baby booms have a long history. In 1870, colonial Melbourne was ’perspiring juvenile humanity’ with an astonishing 42 per cent of the city’s inhabitants aged 14 and under - a demographic anomaly resulting from the gold rushes of the 1850s. Within this context, Simon Sleight enters the heated debate concerning the future prospects of ’Young Australia’ and the place of the colonial child within the incipient Australian nation. Looking beyond those institutional sites so often assessed by historians of childhood, he ranges across the outdoor city to chart the relationship between a discourse about youth, youthful experience and the shaping of new urban spaces. Play, street work, consumerism, courtship, gang-related activities and public parades are examined using a plethora of historical sources to reveal a hitherto hidden layer of city life. Capturing the voices of young people as well as those of their parents, Sleight alerts us to the ways in which young people shaped the emergent metropolis by appropriating space and attempting to impress upon the city their own desires. Here a dynamic youth culture flourished well before the discovery of the ’teenager’ in the mid-twentieth century; here young people and the city grew up together. 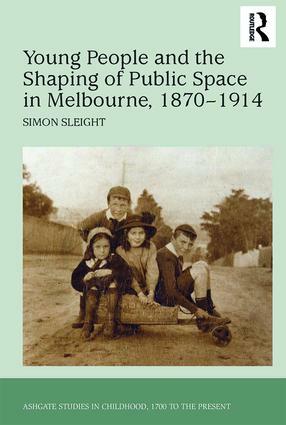 Contents: Foreword; Introduction; Growing up with the city; The metropolitan youthscape: making space and seeking autonomy; Getting and spending: the world of outdoor work and the beginnings of the youth market; Interstitial acts: urban space and the larrikin repertoire; ’For the sake of effect’: youth on display and the politics of performance; Conclusion; Appendix; Bibliography; Index. Simon Sleight is Senior Lecturer in Australian History at King's College London and Adjunct Research Associate at Monash University in Melbourne. He is also Co-founding Director of the Children's History Society in the UK.